Merchant Taylors', one of the 'Great Nine' schools of England, has provided an outstanding education to boys since 1561. As well as boasting exceptional academic results year on year, sport is central to life at Merchant Taylors’. There are over 80 acres of magnificent playing fields with an additional 200 acres of estates providing outstanding opportunities for a wide range of sports including rugby, football, hockey and cricket. The school is a regional centre for England hockey and also hosts a number of elite sporting teams such as Middlesex County Cricket Club, Saracens and Wasps rugby academies and has previously catered for the Australian and South African national cricket teams. The presence of such sporting teams surely is testament to the quality of pitches produced and maintained by Richard and his team of ten. With exceptionally high standards to adhere to and a multitude of sports surfaces to maintain, it is vital that the team has the most reliable and best performing grounds maintenance equipment in their armoury. Therefore, as a long term user of Dennis equipment, Richard was delighted when he had the opportunity to bring in a range of brand new Dennis machines as part of a complete fleet renewal. The new Dennis G860 cylinder mower is lightweight at just 166kg; easy to manoeuvre and comfortable to operate. The handlebar console houses the controls for - throttle, parking brake, roller drive and cutting cylinder drive. The mower also features a large diameter front roller with an adjustable scraper which has been designed for a precise height of cut control, giving an excellent finish on every occasion. The Dennis G860 also features an interchangeable cassette system to assist with a wide range of tasks which gives Richard the ability to use the G860 across more than one sports pitch. “We use the G860’s across all of our winter pitches and they also do our squares in the summer. 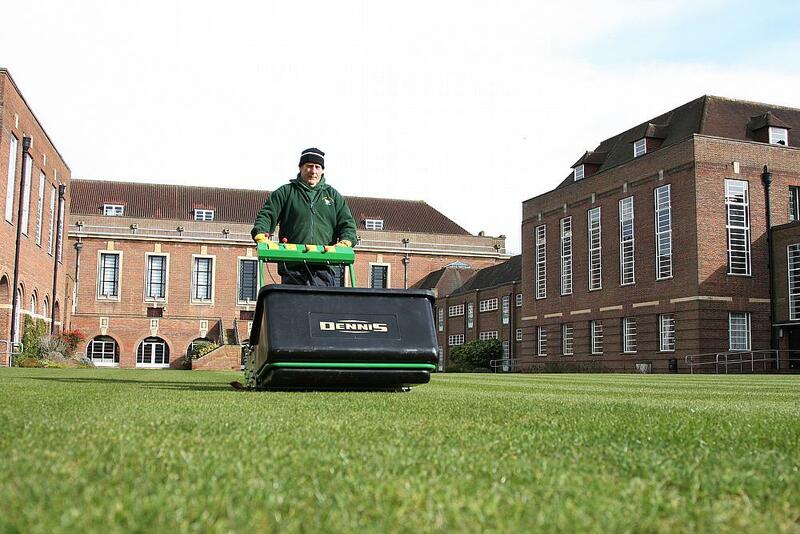 With cricket squares you need to get across them fairly quickly and these mowers allow us to do just that. As one person cuts the square another person follows behind with the Sorrel Roller and opens the top up slightly to allow a little bit of air movement. It works really well. It has cut our algae and other bits on the surface down and allows a bit more drainage through the surface. With over 30 acres of lawns and other grass areas to maintain, Richard completed his Dennis line-up with the purchase of a Dennis G30D cylinder mower. Designed and built following the same concept as the Dennis G860, the G30D incorporates a large-diameter eight bladed cutting cylinder to cater for a wide range of uses to leave a precise cut. “At the moment we have two big lawns at the school and another large grass area. We use the G30D for this work but it is also a good back-up mower for the sports pitches.